I won't hide it. I'm addicted to Pinterest. Why? I don't even know, but I love to pin. I especially love the DIY ideas. I've done a few (I guess I should post the rest too some day), but this one was the greatest success yet! Granted, it was really easy and required no talent. But still, it was fun to do! 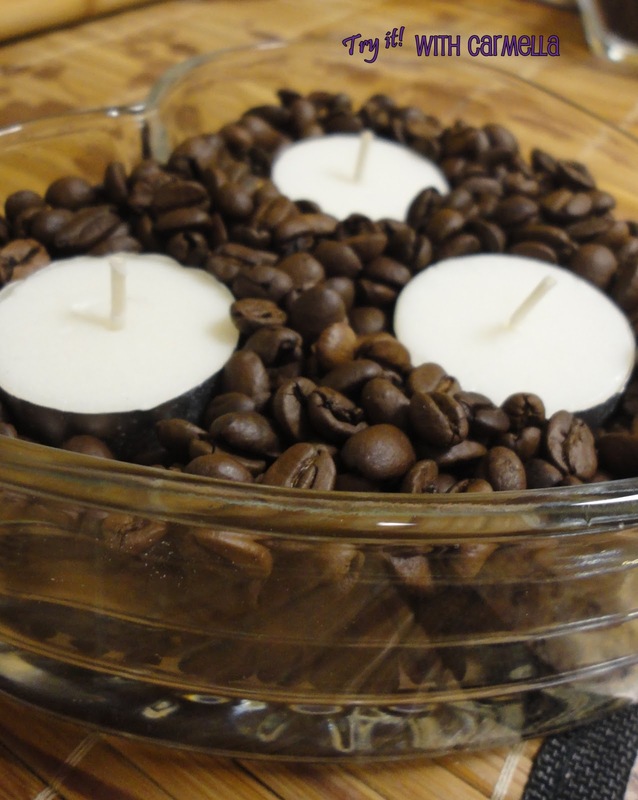 Coffee Scented Tealights .... basically all you need to do is fill any shaped container with coffee beans, push in a few tea candles, and once lit, the heat of the candles allows the scent of the coffee beans to fill the air. It's a subtle scent but very nice- plus it looks pretty! To see the idea I coped from Pinterest, you can look here and here. Alright, that's about it! Check out my photos below and let me know what you think. This is an neat idea...I love your blog, it's so versatile =) I nominated you for the Liebster Award!!! I love Pinterest too! I've had this idea pinned for quite some time and never tried it. I love the smell of coffee, and knowing it works makes me want to try it even more!